You know I love my Kombucha…. and so does Mocha. Here is something else you can make with your Kombucha. Try this the next time you are cleaning the sludge from the bottom of your Kombucha bottle. 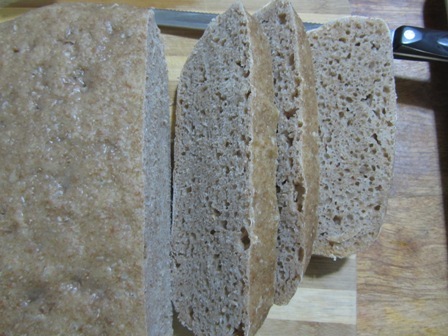 All of that cloudy liquid is perfect for bread making as it is the yeasty build up in this fermented drink. If your Kombucha is getting a little too sour or alcoholly, it means that you need to clean your Kombucha. 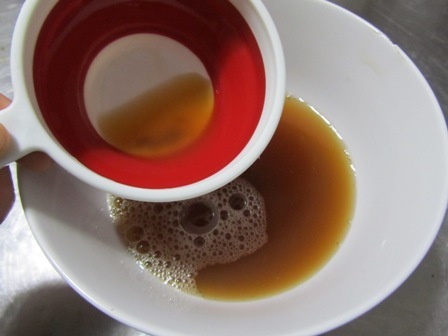 Save about 1½ cups of this cloudy liquid. 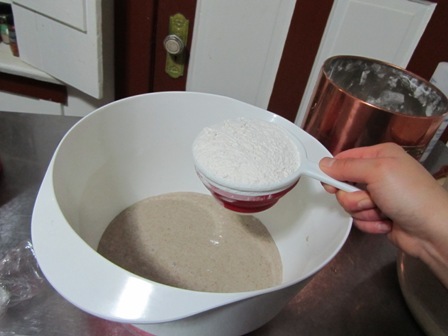 First you will need to make your Sourdough starter. 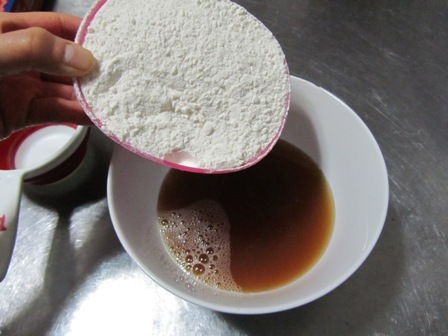 To do this, mix 1½ cup of Kombucha from bottom of jar (cloudier the better) and 1½ cup flour. The mixture might look a little lumpy. 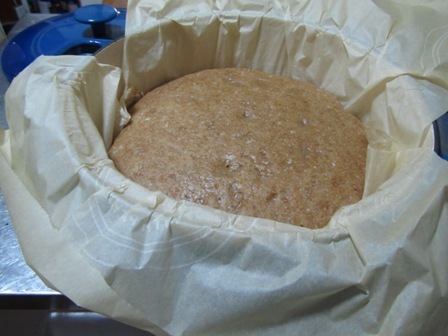 Cover and allow the mixture to ferment in a warm oven. This is similar to allowing dough to rise. 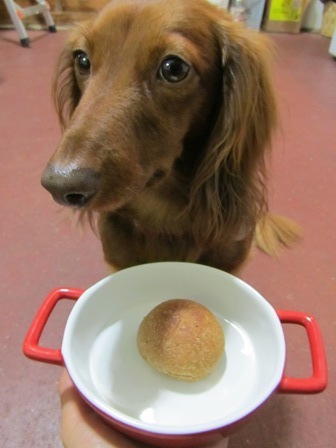 Place the bowl in the oven and turn on the oven light. This is the perfect temperature for rising bread and starting sourdough. 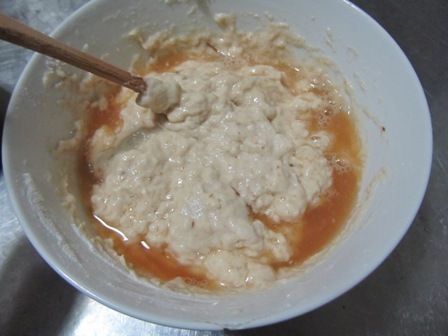 Allow the mixture to sit for 24 hours. At this time you should see tiny bubbles forming. There should be enough yeast now to make your bread. If it isn’t bubbly enough then feed your starter again. 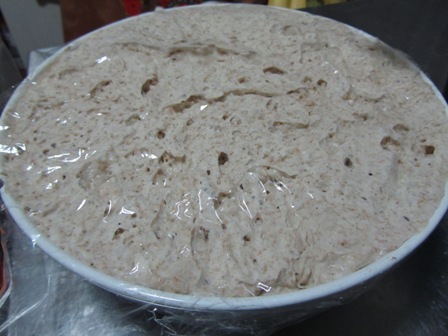 It is best to feed your starter for a couple days before you actually make bread. Your starter will be strong and healthy and will make your bread nice and fluffy. If you don’t have time, you might end up with a rock hard lump like I did the first time I made this bread. 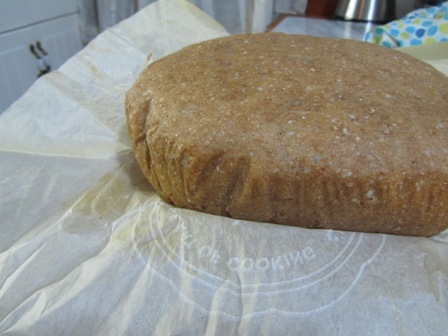 When your starter is nice and ready add flour and water (or Kombucha) to make your dough. Remember to save about 1/2 a cup to store in your fridge to use in the future. Add some salt. Even if you don’t like adding salt to your food, it makes a big difference when making bread. Knead the dough for 10-15 minutes. If it is too dry, add some more water. It should be nice and soft. 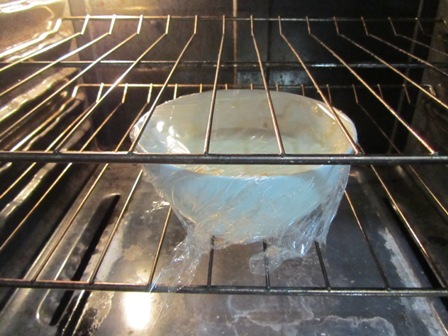 Place your dough in the oven to rise for 4-12 hours. Or until the dough has doubled in size. Place your dough into a lined dutch oven. My dough was a little sticky but it still ended up fine. Bake in a 350 Degree oven for about an hour. Once done, remove the bread from the dutch oven onto a cooling rack. 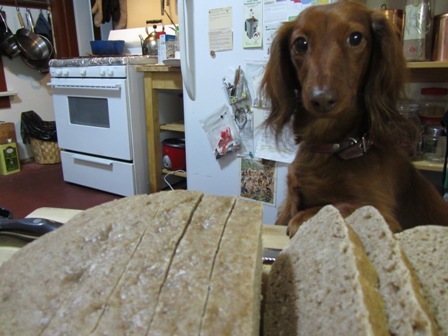 This bread is so yummy that it might attract unwanted guests. This starter will make a super tangy tasty bread. You can keep your starter in your fridge just like any other sourdough starter. Remember to feed your starter every week. My future experiment with this recipe is to make a gluten free version of this. 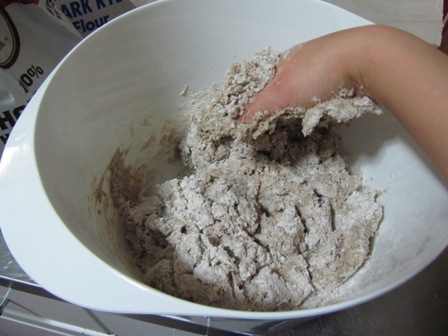 Instead of using wheat flour, use rice flour to create your starter. I will keep you posted on how that turns out. 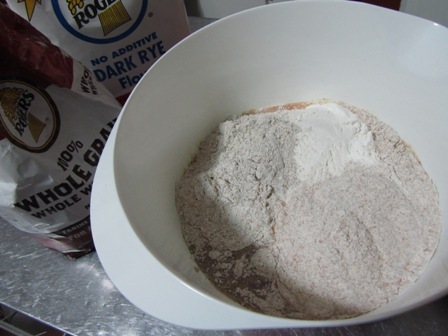 In a bowl mix the Kombucha and flour until combined. It can be a little lumpy. Set aside for 24 hours. I placed mine in the oven with the light on. Check the starter to see if any bubbles have formed and if it has doubled in size. 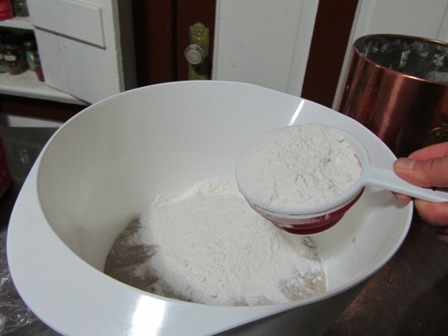 If it isn’t bubbly or hasn’t doubled, then feed it another 1/2 cup of flour. It might take a couple days for this starter to get strong enough to use. Starter should be room temperature and have been recently fed. 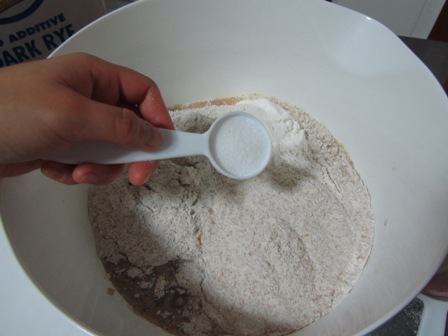 Combine starter, salt and water in a large bowl and mix until the salt has dissolved. Slowly mix in the flour. It may be easier to use your hands. If the dough is too thick, add more water. The dough should be soft and easy to work. 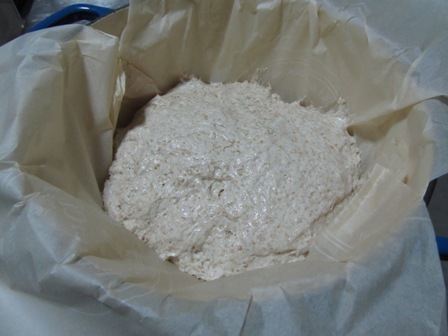 Knead in the bowl for 10-15 minutes. Shape into a loaf. Avoid pressing down on the dough to do this. Place in a buttered loaf pan. 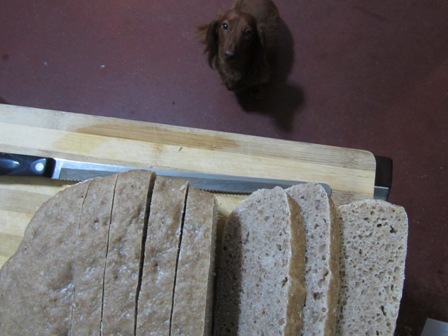 Cut a few slits in the top of the loaf. Once it has doubled, then bake at 350 degrees for an hour. 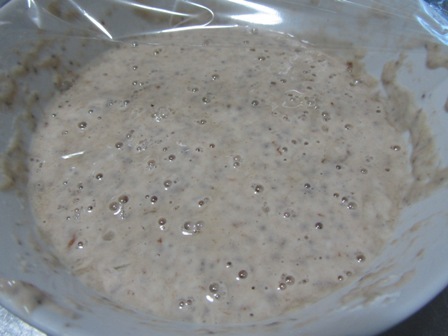 Here is another wonderful site for sourdough starter. Is that parchment paper in your dutch oven or something else? Yes it is parchment paper. It helps the bread not stick. How do you feed the dough after you’ve taken 3 cups out? Do you just add 3 cups of flour and Kombucha tea back to the starter to keep it going? 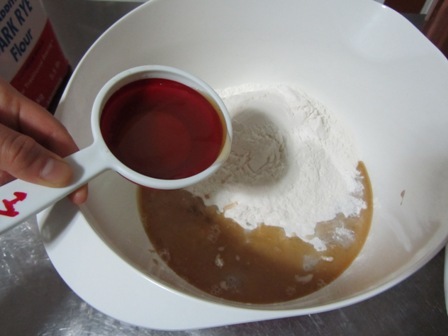 I just usually add 1/2 cup of flour and 1/2 cup of water to the starter. Let it sit for a couple hours or over night. You will end up with extra starter which you can just discard or make pancakes with.